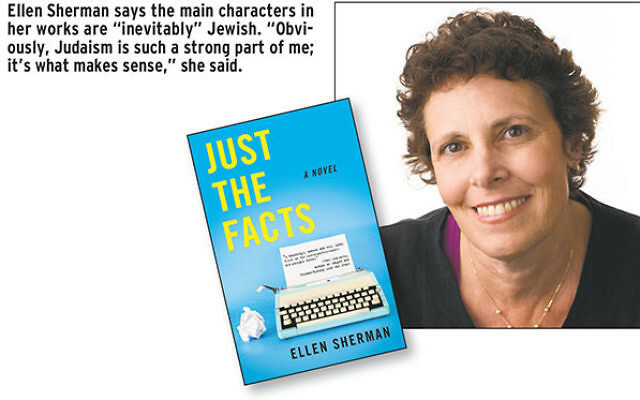 Just the Facts, by Ellen Sherman of Glen Ridge, examines what it’s like to be young, Jewish, and finding your way in the world in the late 1970s in the not-so-deep South of Anne Arundel County, Maryland. Nora Plowright, originally from Montclair, with her bachelor’s degree in English in hand, takes her first job as a reporter at the Anne Arundel Record. She is the only Jew around. Over the course of the novel, published by She Writes Press, Nora has to discover answers to the big “Who am I?” questions, including those related to her Jewish identity. We observe her as she hides behind an Americanized name that does not announce her faith to her colleagues and friends, has awkward conversations about her religion with non-Jewish roommates, takes definitive action when her non-Jewish boyfriend uses a slur, and speaks with God while wondering if she is really a believer. Along the way, she stumbles onto a serious news story involving highway construction and political corruption. Sherman places Nora’s religion insecurity within her larger wariness about the world around her: “Nobody around her was Jewish, and she was afraid about how people would react, and afraid of being ostracized.” Sherman calls Nora’s behavior “not the most admirable,” but suggests that that’s what makes the character interesting. Nora is “more of an anti-hero who is really struggling,” Sherman said. Sherman grew up in Merion, Pa., and her family belonged to Main Line Reform Temple Beth Elohim in Wynnewood. She attended religious school there through confirmation, but did not celebrate becoming bat mitzva. The family rarely went to synagogue. Holidays happened at home. “I actually include Thanksgiving as a Jewish holiday because we have really big family gatherings for Rosh Hashana, Thanksgiving, and Passover — and it’s all Jewish; all my cousins” come, she said. Sherman graduated from Trinity College in Hartford, Conn., in 1978 and left her protective, suburban, secular-but-deeply-identified-as-Jewish home for Glen Burnie, Md., to work as a reporter at the Maryland Gazette. In Nora, that same compassion and a desire to get things right is augmented by a desire to please everyone around her. As Sherman puts it, “She doesn’t want to get things wrong, and she doesn’t want to screw up, and she doesn’t want anyone to be mad at her. In any case, while Nora struggles with how to tell her reported stories within the plot, Sherman is crafting her own larger truths. Sherman has what she describes as a “rock solid” Jewish identity, but is no longer a member of Temple Ner Tamid in Bloomfield, where she sang in the choir and taught in the religious school while her children were growing up. She struggles against the idea that a synagogue must be the focus of observance. “I get upset when people think spirituality is so tied to going to synagogue. There’s a lot more to being a spiritual person,” she said.